You searched for hoop - Pebbles, Inc.
Hey Pebbles friends and fans, Becki here. Christmas is right around the corner. I love Christmas and I love making my own Christmas decorations. I put a little spin on a traditional banner to create a banner to hang in my home for Christmas this year. 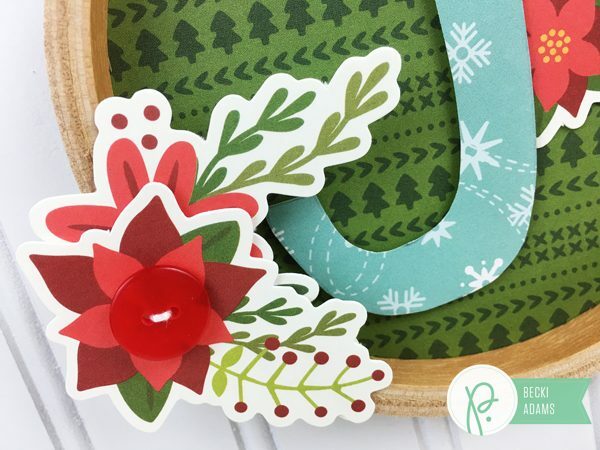 I used 3 embroidery hoops, die cuts, stickers, and patterned papers from the brand new Holly Jolly collection. 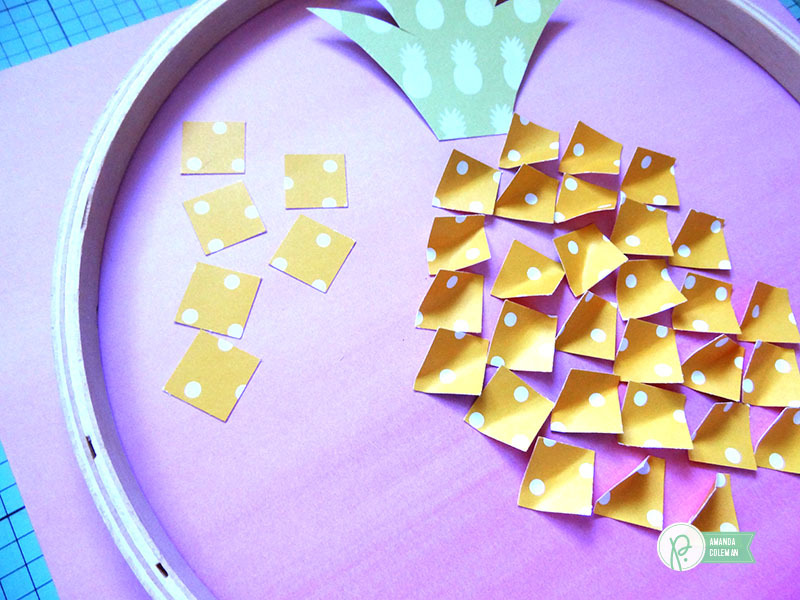 The first thing I did was to fill the inside of these hoops with patterned paper. 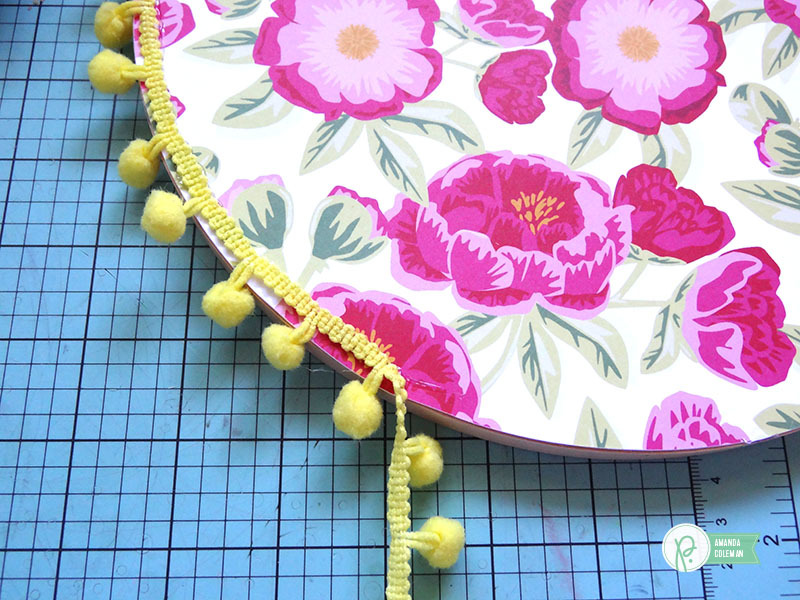 I used a strong liquid adhesive to adhere the embroidery hoops to the patterned papers. After the adhesive dried, I carefully cut around each embroidery hoop with an craft knife. 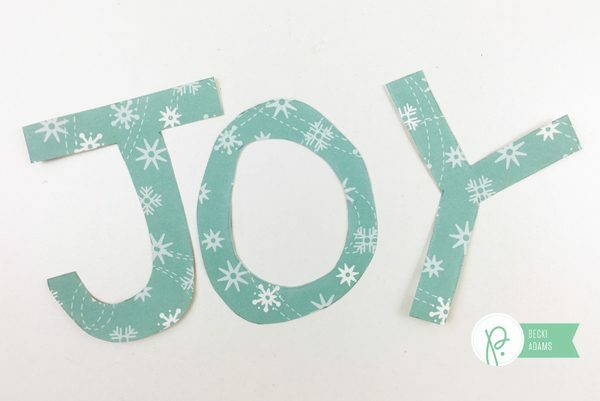 I wanted the banner to have the word “JOY” in it so I hand cut the letters from the blue snowflake patterned paper. 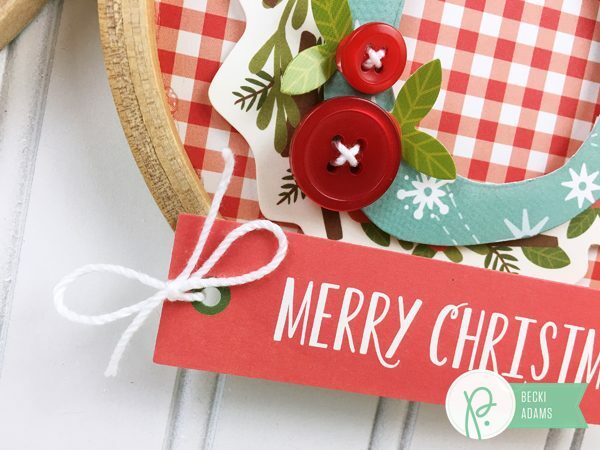 I chose the blue patterned paper because I wanted a contrasting color against the red and green backgrounds. Then I chose a few die cuts, stickers, and red buttons to embellish the banner. I couldn’t be happier with how this project came together. I love that it’s just a little bit different than a traditional banner because of the embroidery hoops. 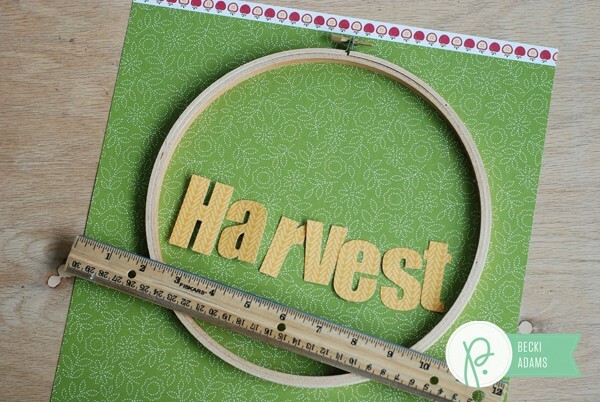 The letters are adhered to the patterned paper on the back of the hoop with dimensional adhesive. I added die cuts and buttons to the front of the hoops. I made sure to use a string liquid adhesive so the embellishments stayed in place when I hung my banner. This project looks complex but it really isn’t it came together very easily. What home decor Christmas projects have you created? 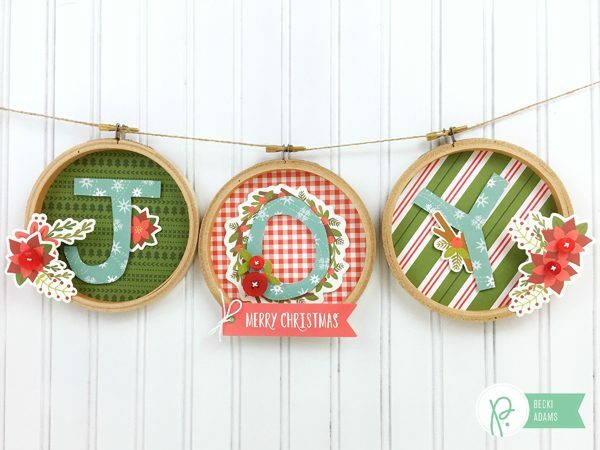 You should try creating your own embroidery hoop Christmas banner. It’s easy and SO cute. Thanks for stopping by the Pebbles blog. I’ll see you again soon! Hi Pebbles fans! Amanda here today. I so love November. The weather finally gets to a chill, it’s my birthday month, and we get to have a Thanksgiving feast. It seriously is my favorite month of the year. 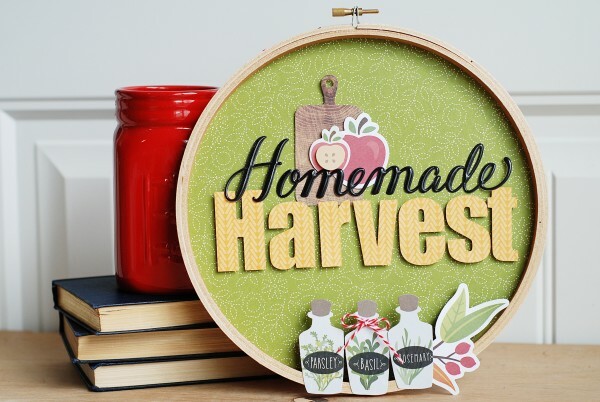 I also love embroidery hoop decor. 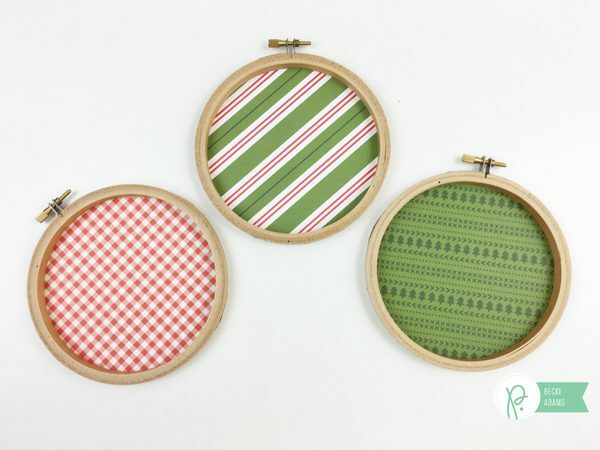 Embroidery hoops are inexpensive and widely available which makes them perfect for seasonal decor. 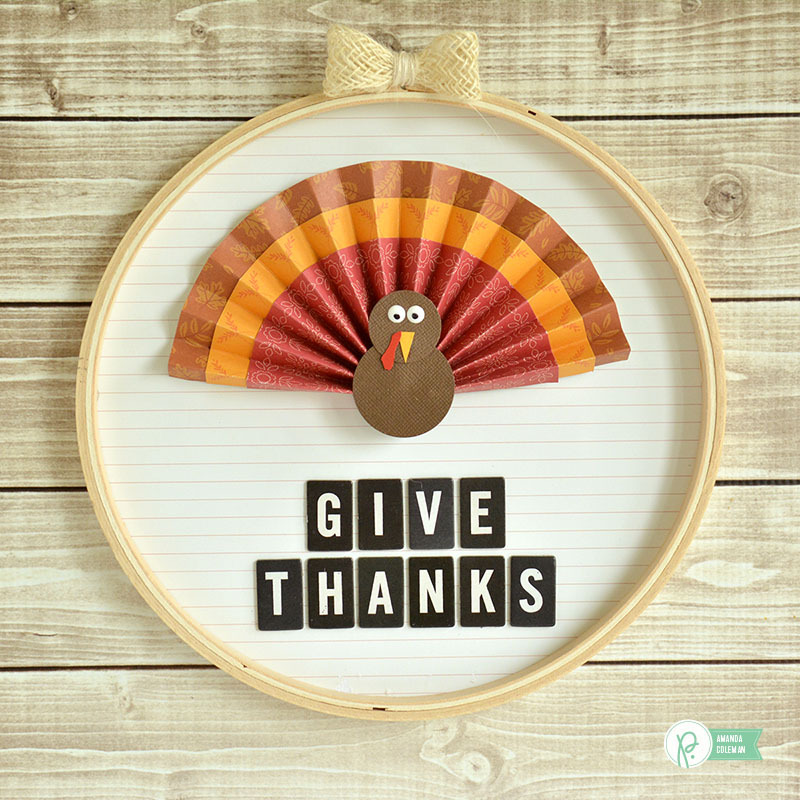 This happy turkey hoop decor comes together in a snap and is super easy to make. 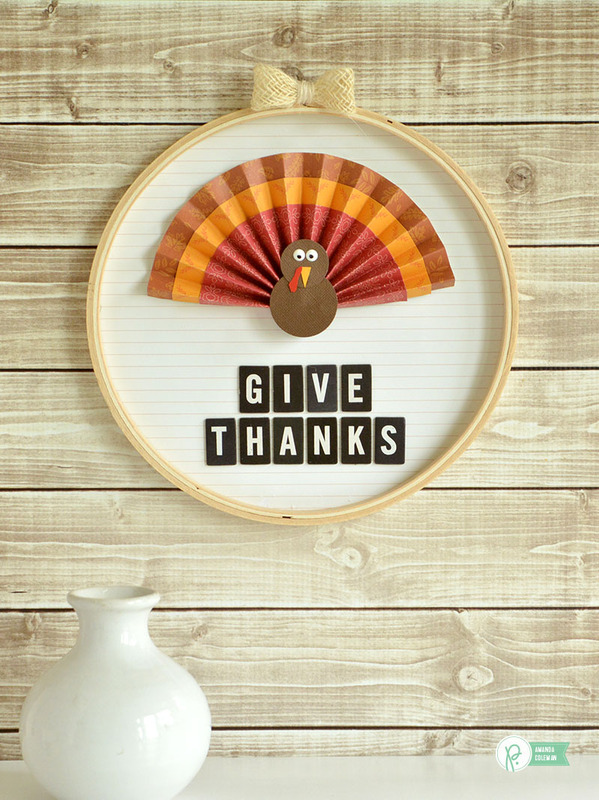 I love how the shape of the turkey feathers follow the line of the hoop. 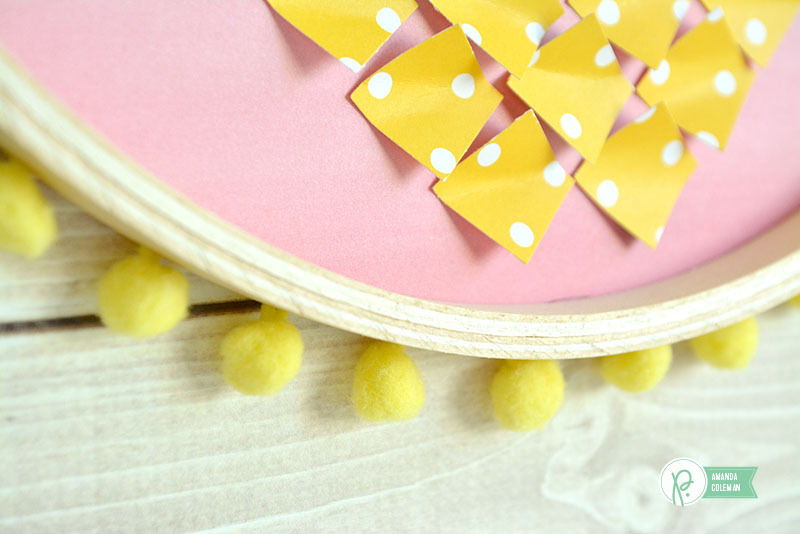 This project is kid friendly, too (with a little help with the glue gun). 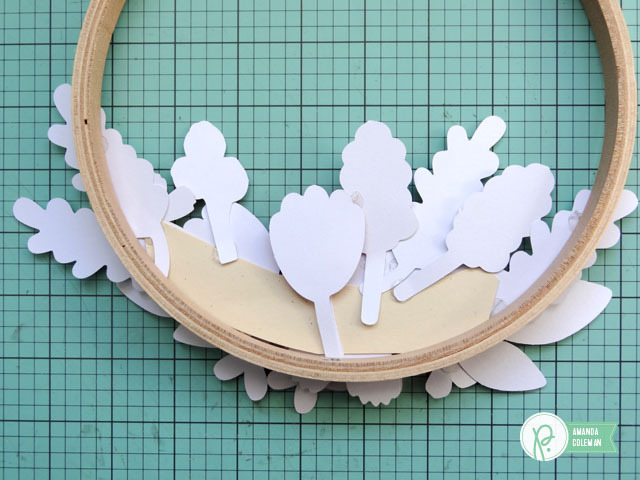 When creating a piece of embroidery hoop decor, sometimes I adhere the paper to the top of the hoop, sometimes I adhere it to the bottom of the hoop. Since this turkey has a lot of dimension, I decided to adhere the paper to the back of the hoop. I like to hide the embroidery hoop attachment with a pretty bow. Burlap adds a soft, rustic touch to this Thanksgiving decor. 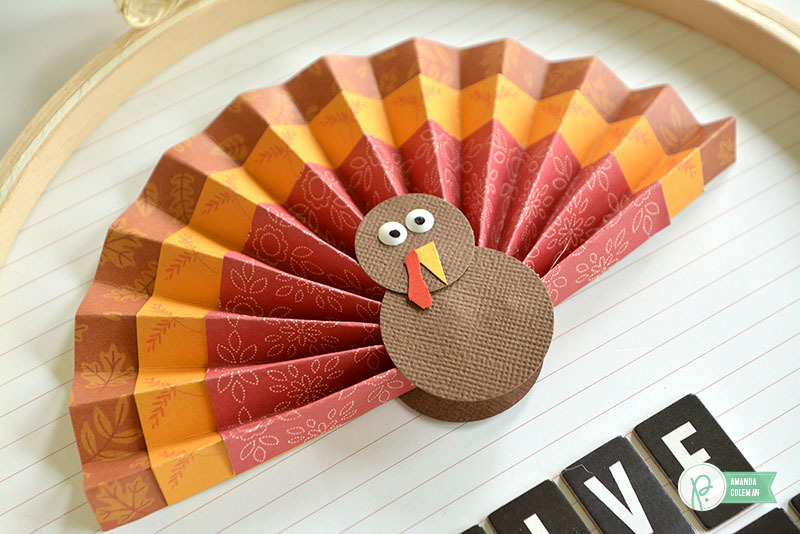 To create the turkey feathers, score and fold three 12″ strips of patterned paper into accordion fans. 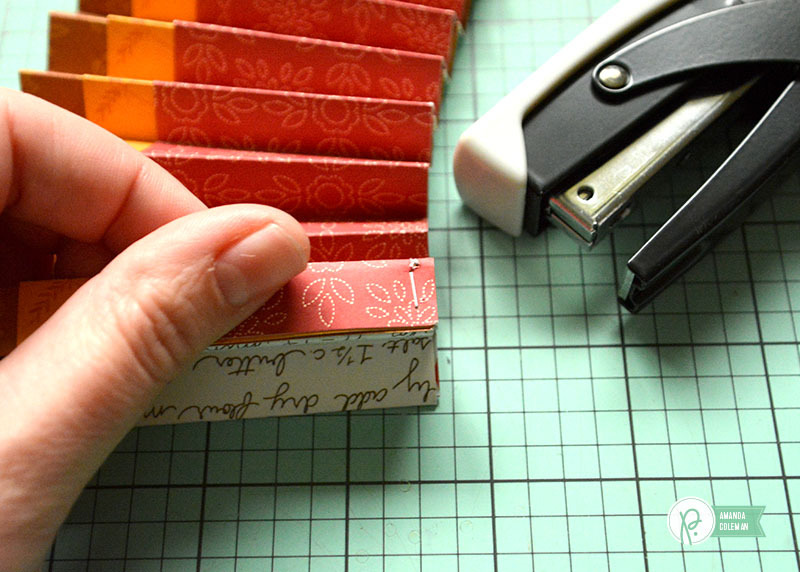 These strips of paper are 3 1/4″, 2 3/4″, and 2 1/4″ wide. 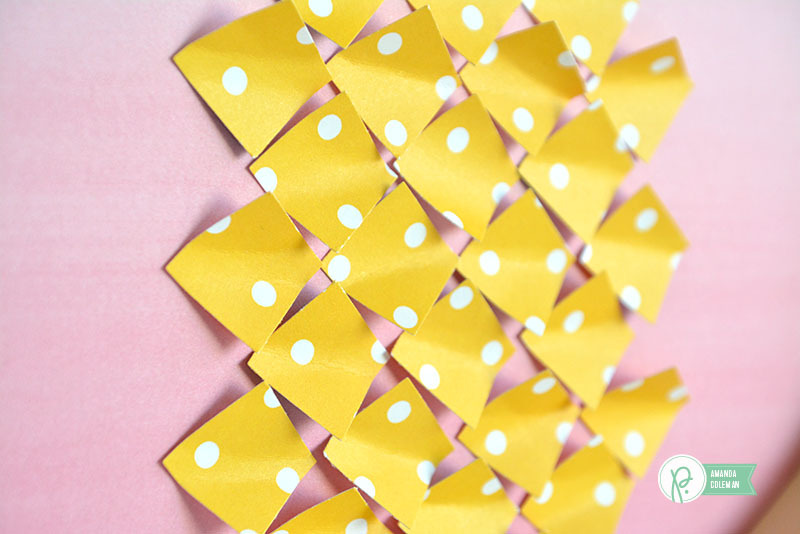 Vary the width of the paper depending on the size of your hoop. 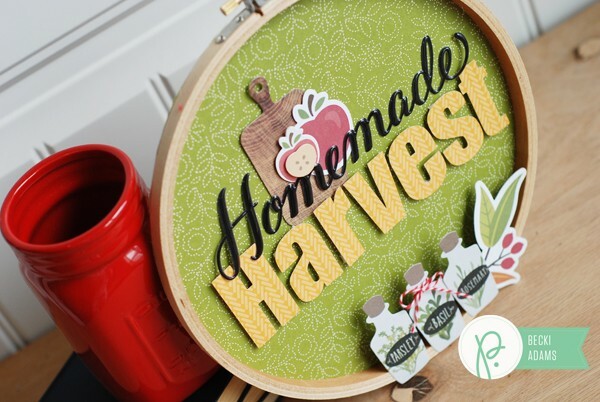 I used a 9″ embroidery hoop for this project. 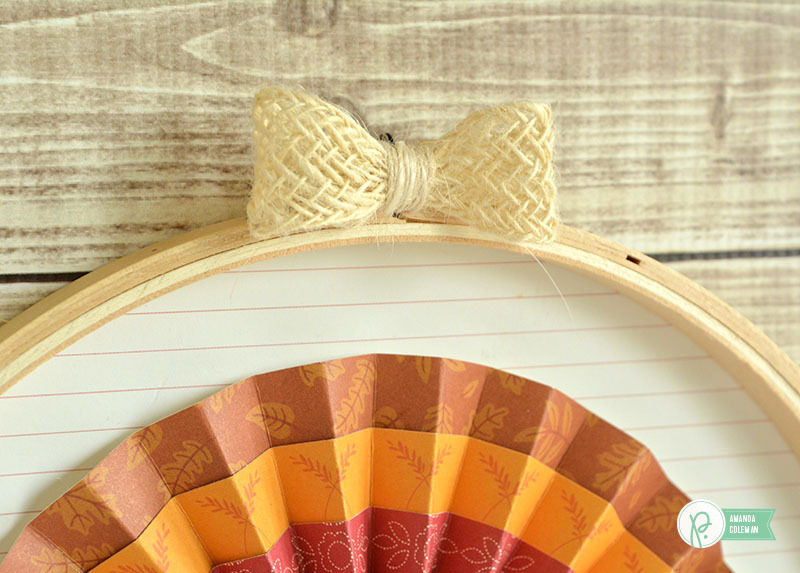 Keep the three layers of your fan together by stapling the ends together with a mini stapler. This will keep your fan layers from flying all over the place. After you have stapled the ends of your fan together, put a huge blob of hot glue on a circle punch and place the end of the fan right in the middle. 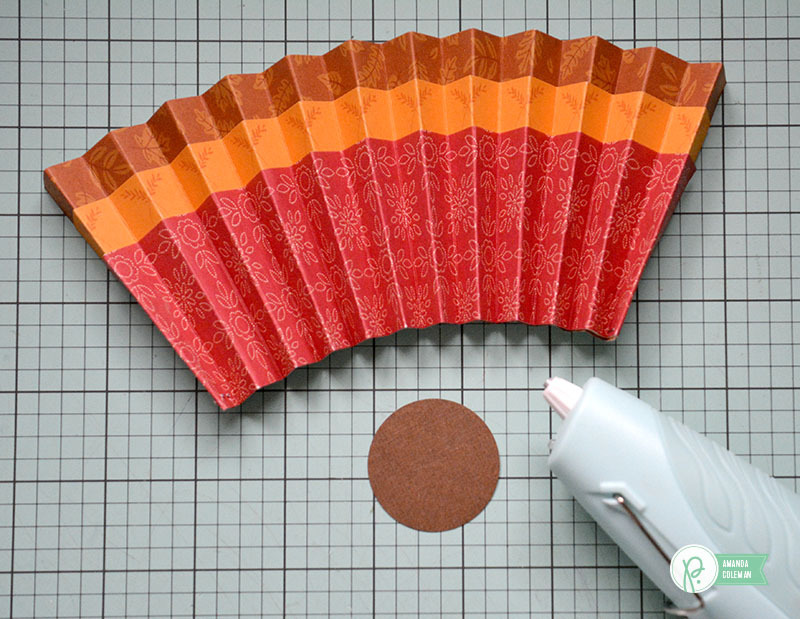 Hold down the paper fan until the glue dries completely. Two words: Slick. Writer. This magical pen makes the turkey’s eyes possible. Draw a black spot on a white enamel dot and you have instant eyes. 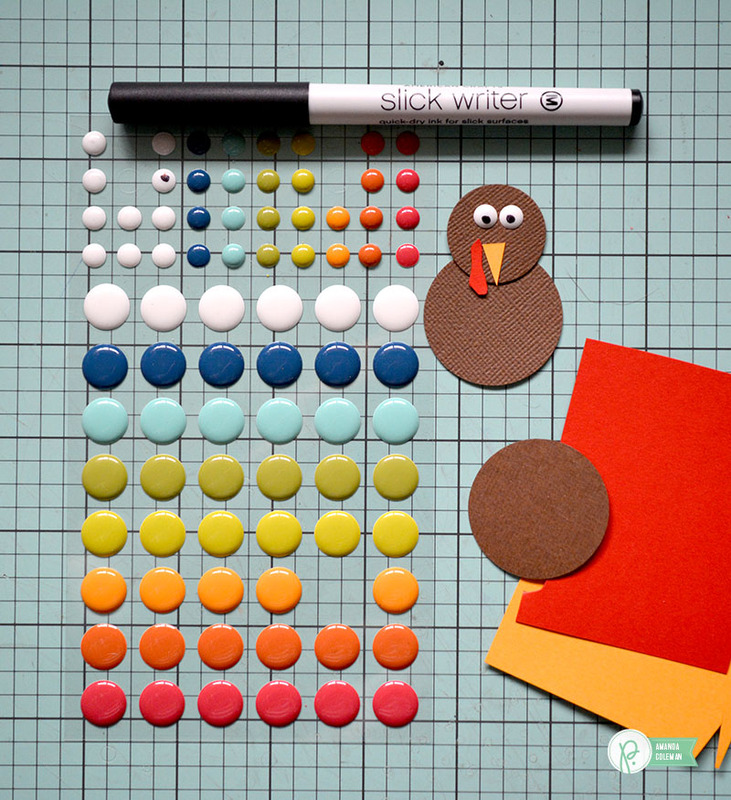 Making a paper turkey is way easier than it seems. Layer two brown circle punches (1 1/2″ and 1″), trim a beak and a wattle out of scrap paper, and adhere the eyes. So easy. 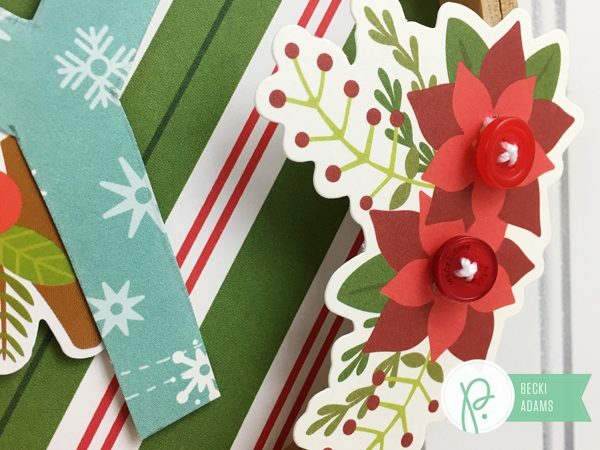 Add a festive sentiment with Thickers, adhere the embroidery hoop to the paper and trim any excess with a craft knife. Top with a cute bow. Friendly Turkey Day reminder! If you are cooking a frozen turkey next week, now is a good time to put it in the fridge to thaw. Only one week to go! Hi friends, Becki here. I’m so excited to share with you this embroidery hoop Fall decor that I created with the Harvest collection. Fall is my favorite season, hands down. I love everything about it. One of my favorite things about Fall is the colors and Fall decorations. 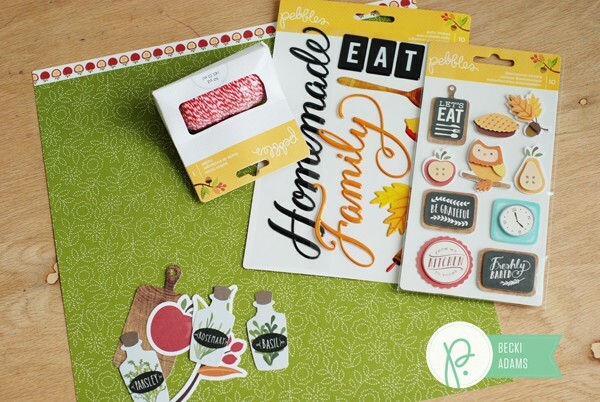 This collection is focused on home, cooking, and baking. I created this to hang in my kitchen during Fall months. 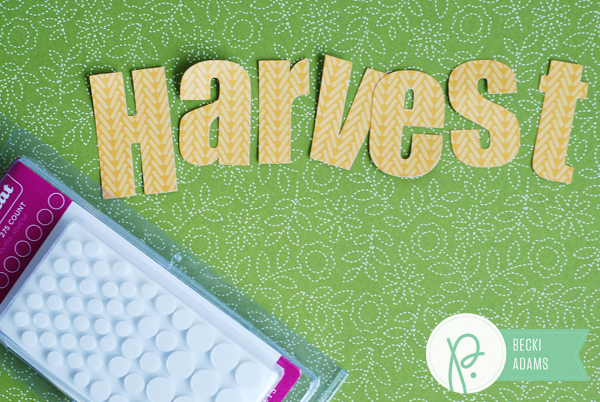 I started with a few supplies from the Harvest collection. 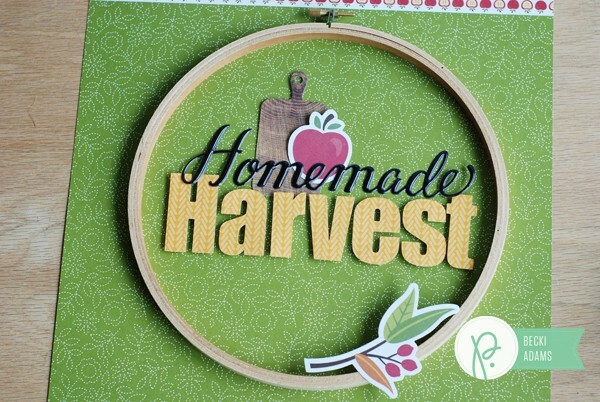 I used my Silhouette Cameo to cut “Harvest.” I used a ruler to measure the width of the embroidery hoop a little below the center of the hoop. After I had the letters cut and measured, I adhered the embroidery hoop with heavy duty liquid glue. Then I adhered the letters with dimensional adhesive. Then I got started with the fun part, embellishments. The big puffy “homemade sticker is my favorite part of this project. 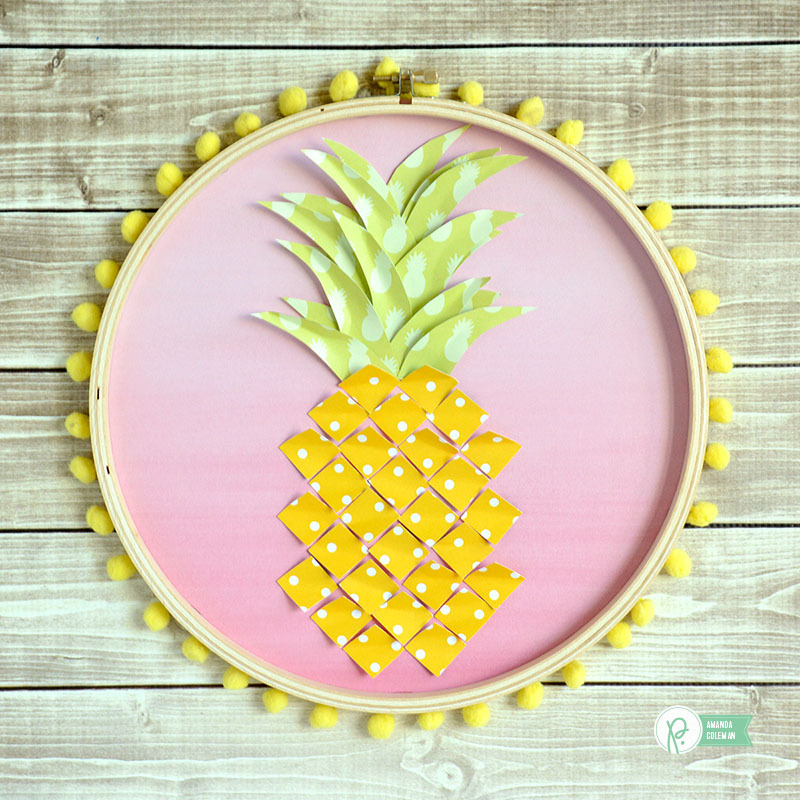 I layered it on top of a cute cutting board die cut and an apple die cut. At the bottom I adhered a branch die cut to the embroidery hoop. 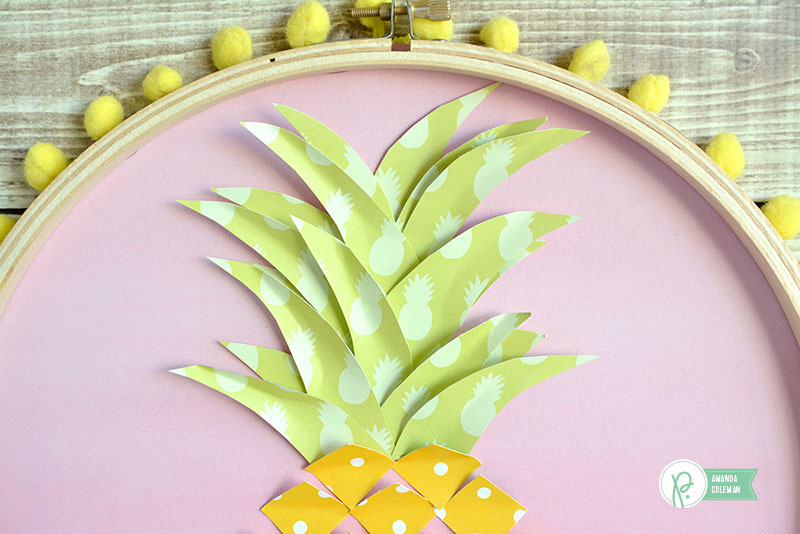 This die cut isn’t attached to the background paper, just to the hoop. 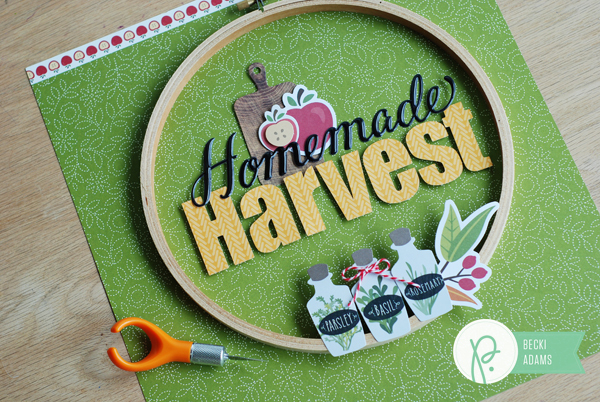 To finish embellishing my embroidery hoop I grabbed these three adorable spice jar die cuts. 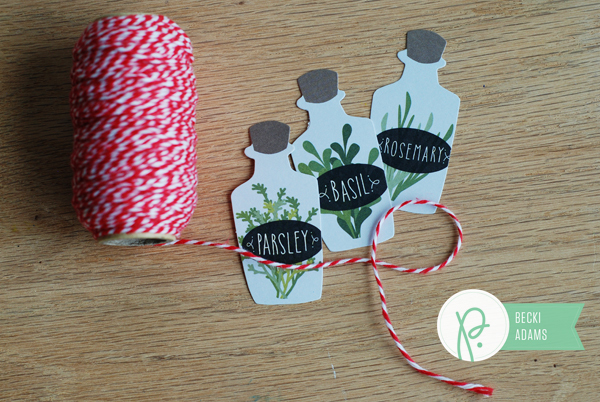 I used some red and white twin from the Harvest collection to tie a bow around one of the jars. I adhered these jars to the outside of the hoop. These die cuts are not adhered to the background either. The last thing I did was cut the background paper away from the embroidery hoop with a craft knife. Happy Fall, I’m so excited to hang this in my kitchen to enjoy during the Fall months. What is your favorite Fall decoration? I am so glad that it is almost Spring! Soon leaves will start budding on trees and flowers will appear en masse. Fresh flower trimmings will brighten indoor spaces, but only after I scold my kids for picking all of the fresh blooms from the landscaping. Sigh. 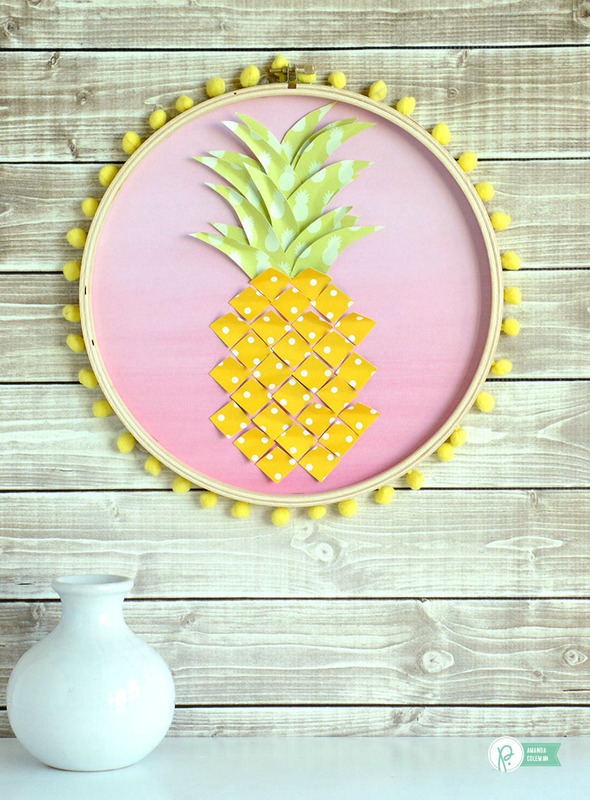 If you are a Pebbles Blog regular, then you know that I love making home décor pieces with regular ol’ wooden embroidery hoops. 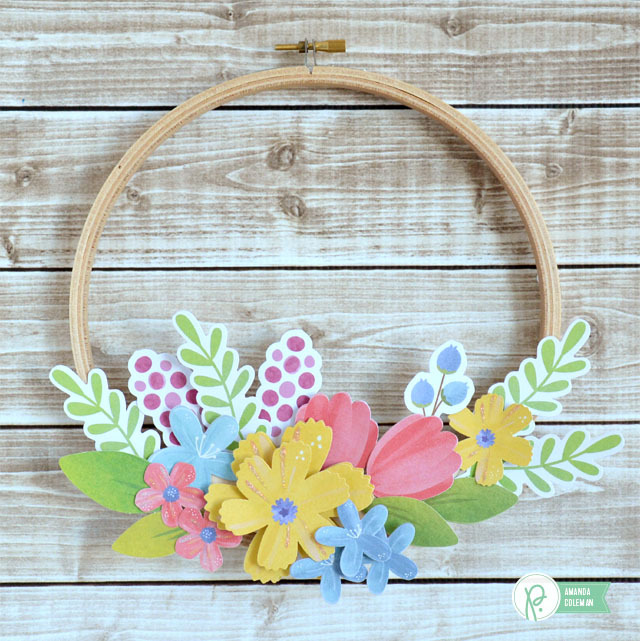 Inspired by the brightly colored flowers in the Home Grown collection, I dug into my stash of embroidery hoops to create a simple piece of embroidery hoop décor. 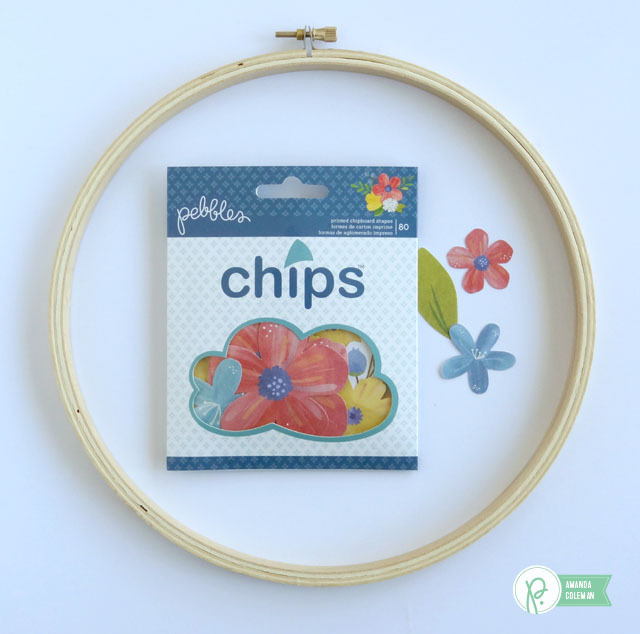 BONUS: Embroidery hoop décor also doubles as dog toys! Double sigh. Guess what? 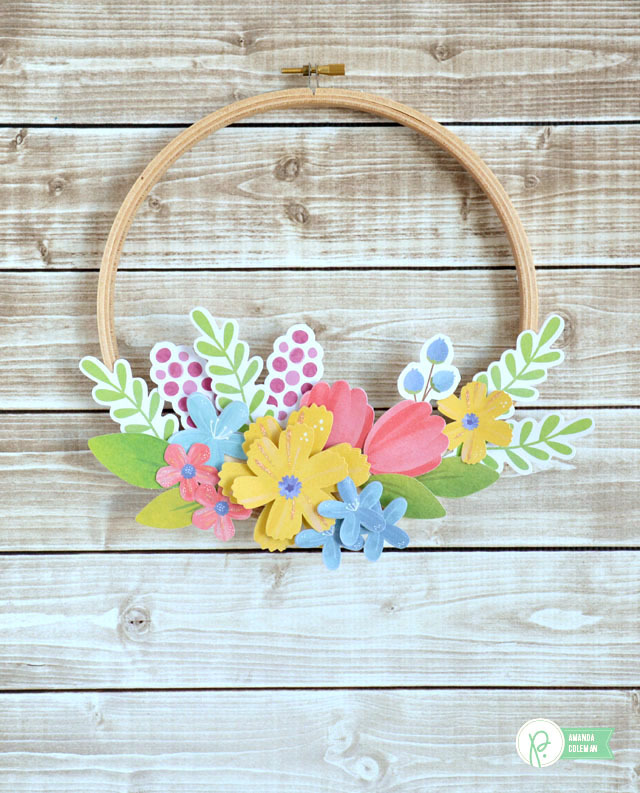 There was a fussy cut made to create this bright, floral wreath. Yesss! Pebbles makes flowers easy. 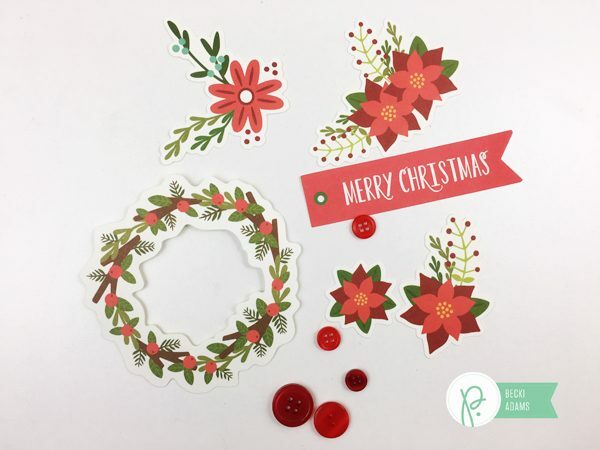 The only supply I used to make this wreath was a package of die cut flower chips. There are 80 flowers and leaves (bonus!) in this package, which is more than enough to go the entire way around a hoop to make a more grand wreath. And they are so pretty, too. 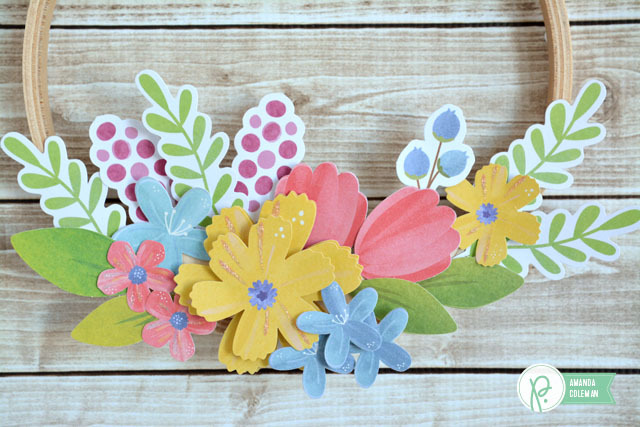 An easy way to plan your bouquet is to trace the embroidery hoop onto a piece of cardstock and play around with the floral arrangement. This gives you the freedom to experiment and change your mind before anything becomes semi-permanent. TIP: Take a picture of your final arrangement to use as a reference when putting your flowers onto the embroidery hoop. 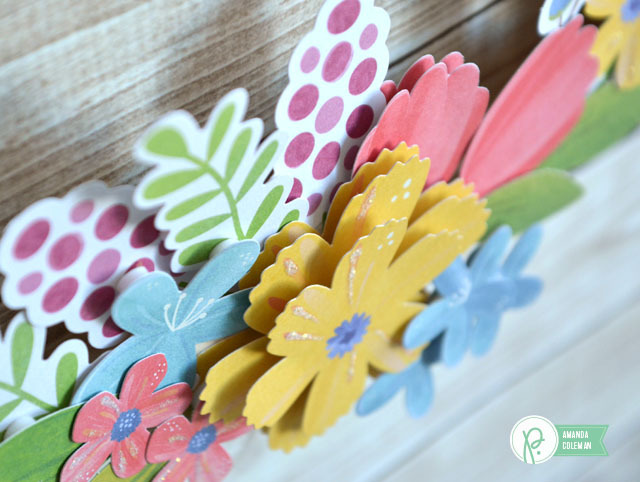 Layer the larger flowers with foam dots to help create a bold focal point. 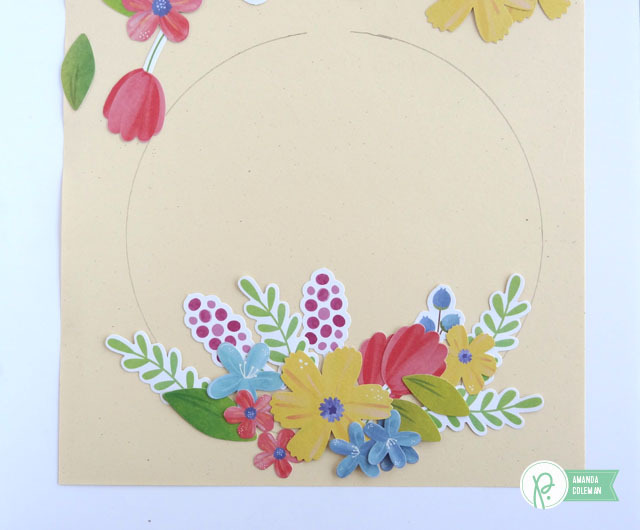 Rather than assemble your paper flower bouquet directly on the embroidery hoop, cut out a little piece of the circle to use as a base. This will help ensure that your bouquet follows the curve of the hoop. Trim any excess away after you have assembled your bouquet. Add a bit of extra sparkle and dimension to your flowers by highlighting the flowers with glitter glue. 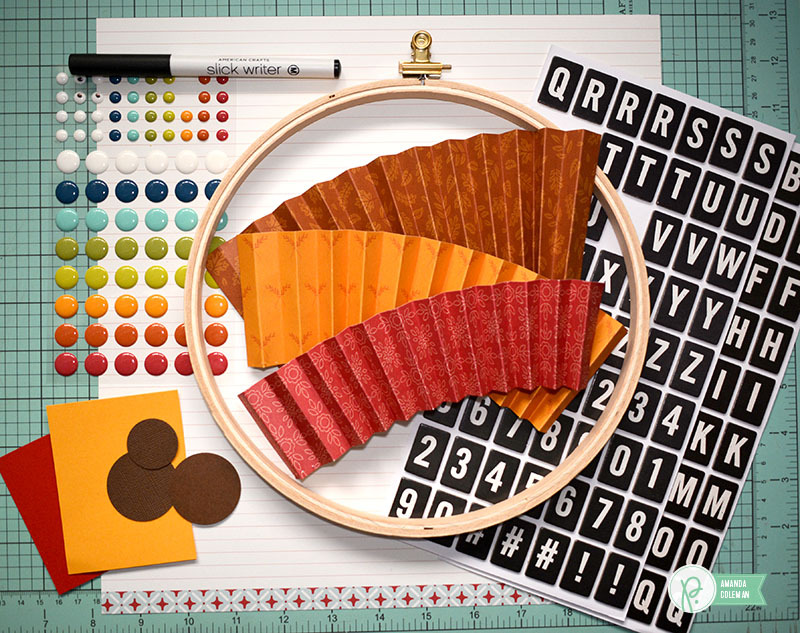 Yep, the very same stuff that you hoarded as a kid is still a very useful craft supply. 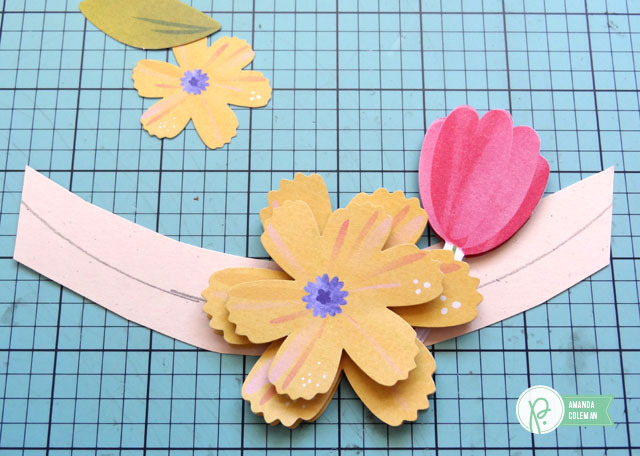 Attach flowers to the front and back of the cardstock as you create your bouquet. This will add depth to your bouquet and help you get the flowers in just the right place. After your bouquet is assembled, use foam dots throughout to add dimension to your bouquet. I used several foam dots to separate different flowers and pop up leaves to give the bouquet more depth.